When I first decided to try this ink it was out of stock. That got me the misty blue, which I like. I now have the marine and I love it. For me it's just the right mix of blues and greens. It comes out with a nice intensity. In the Parker 45 it has a wonderful depth. In my Rialto it appears paler - intriguing how an ink can look so different in different pens. It's still a lovely colour though, just paler. 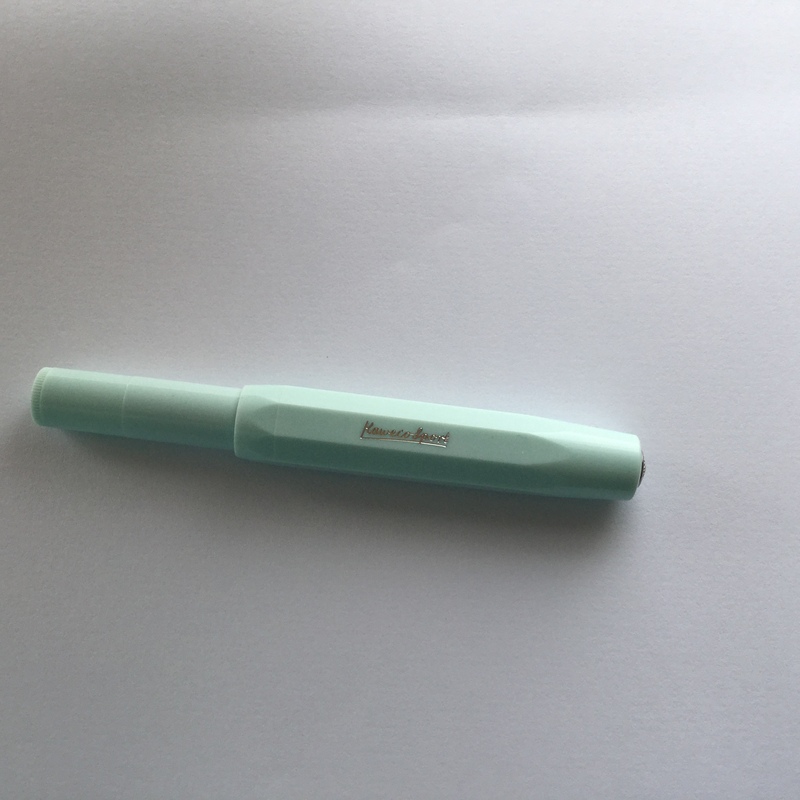 I bought this pen partly out of curiosity, partly purely because it came in a mint green colour and I love mint green. It's relatively cheap and to be honest, it looks and feels cheap. When I hold the pen I can feel the joint between the nib section and body move slightly. I will be sticking with cartridges for this pen, as the filler is likely to be pretty teeny; indeed I haven't read a good review of the bottled ink converters. I opted for a medium nib, as it's my preferred width. As with my Parker Rialto, this medium has a slightly flat appearance, so there's a discernible difference in stoke width. To my mind, that alters the look of my writing - and not necessarily for the better. The nib is ok - I have had some skips and false starts. It isn't nearly as gorgeous as the nib on the Faber-Castell Loom. As said earlier, I don't think it quite suits my writing style. I have used two ink colours in it so far and it doesn't seem to produce the colour depth that some of my other pens do. Diamine's imperial purple looked a bit more like a pale violet than the rich depth I get when using it my Faber-Castell. The pen is as light as a feather and teeny when closed. It needs to be posted, or it is a bit short for writing with. After several days of usage the nib still skips a bit. Other than that the pen is easy to use. I have been writing with it quite a lot, to see what I think of it. For jotting down quick notes it is fine and for a smaller hand it would be a great pen. For me, the barrel is just a little narrow to be comfortable for a long writing session, as I have large hands. I have a similar problem with my Parker Rialto and for that reason I prefer to write with my chunkier pens. These Kawecos get good reviews, for value for money and, apparently, for being extremely robust. I have no desire to test that, but it is small (and cheap) enough to drop into a small purse or bag. In conclusion, this is a perfectly useable pen, good value for money and easy to chuck into a bag. That said, it's a little too small for my hand and I doubt I would buy another Kaweco Sport. I bought this pen purely because of its looks. I opted for the violet cap. It arrived in a very nice, card, presentation box, in a nice sleeve. For a £25 pen I thought the presentation was excellent. The box contained a cartridge and also a cartridge blank. The Loom takes the short cartridges and the length of the barrel means you can use the blank to ensure the cartridge remains securely attached to the feed. You could also do that with a spare cartridge. I bought the Faber-Castell converter, though, as I prefer to use bottled ink. There's something I find quite soothing about the act of filling a pen from a bottle of ink. The Loom is heavy, possibly the heaviest fountain pen I have, weighing in at 34g. My Parker IM is 30g and my TWSBI 580 is 28g, although it really doesn't feel like it. The Loom looks gorgeous, it really does. I currently have it filled with Diamine Imperial Purple and the colour on the page seems much more intense than the same ink in either the Kaweco Skyline Sport, or the Parker Rialto (all three with a medium nib). Mind you, both the Kaweco and the Rialto have a definite breadth to the nib, almost as though they have a flattened tip. The Loom produces a very nice, rounded line. The nib on this pen is quite possibly the smoothest I have ever written with, it really is. It just glides across the page, it really is beautiful to write with. Unfortunately in use the pen is a little fatiguing, because it's so heavy. Some reviews have commented that the grip on the Loom is slippery. I haven't found this to be the case at all. My Parker IM does have a slippery grip, as is sometimes the way with a metal barrel. The Loom doesn't, nor do the horizontal grooves bother me much. The cap is a very firm fit - it can be hard to get off the pen. It comes in a range of stunning colours (yes I am tempted to buy more and fill them with matching ink colours), but it does feel quite plastic. 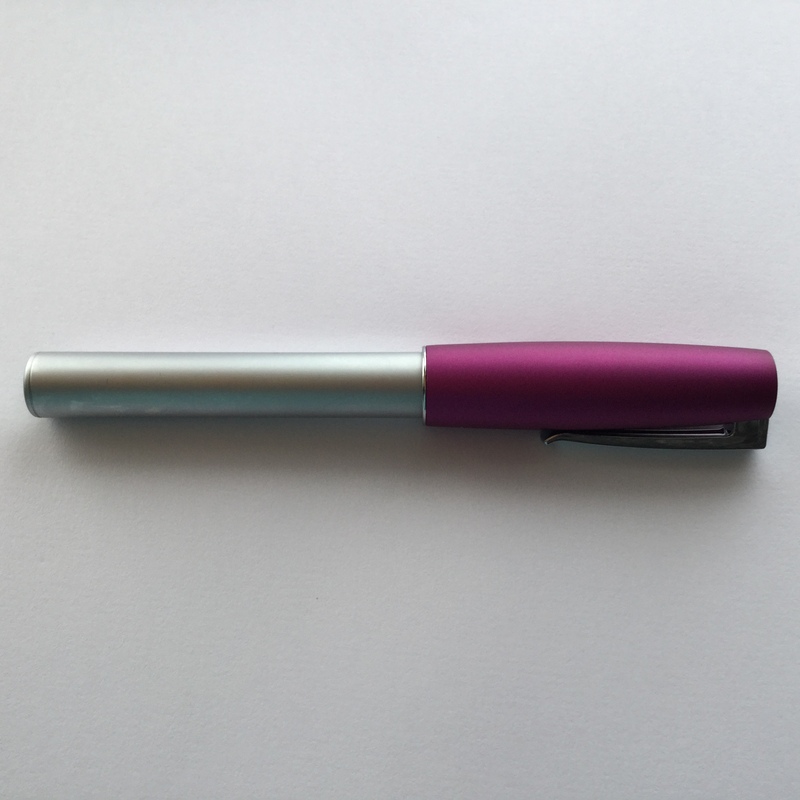 The pen can be used posted or unposted and the cap doesn't really alter the balance much, which is handy. Overall I am very impressed with this pen. The only negative at all is that it is a little heavy. Aside from that, it is an absolute winner. And that nib… it pushes this pen into a close second place, after my trusty Parker 45, with its 14k gold nib. I have had this pen for a month now and I am impressed. It has quickly become my daily pen, partly because I tend to write a lot and this pen holds a lot of ink. Initially I thought the nib was a little scratchy, compared with my Lamy Al-Star, which is my only other fine nib pen. However, it seems to have settled down quite nicely. I am aware of it when I write, but that isn't a major problem. As this is my daily pen it is filled with Parker black Quink - the ink I have used since childhood. It holds almost 2ml of ink and so far I have only had to fill it once a week, which is great. I would feel comfortable going away with just this pen (I write a lot of notes for work, plus a daily journal - away from home I only write the journal). The pen weighs in similar to my Parker IM, despite being plastic compared to the metal of the Parker. However, it doesn't feel as heavy in the hand. The grip is fine for my hands, although in a small hand it might seem large. It starts well every time, with no skipping or false starts. On some papers (Leuchtturm, I'm looking at you) it can seem to lay down a thin, weedy line of black. I think that might be partly down to the fine nib and that black is somewhat unforgiving in this respect. On typing paper, it looks fine. 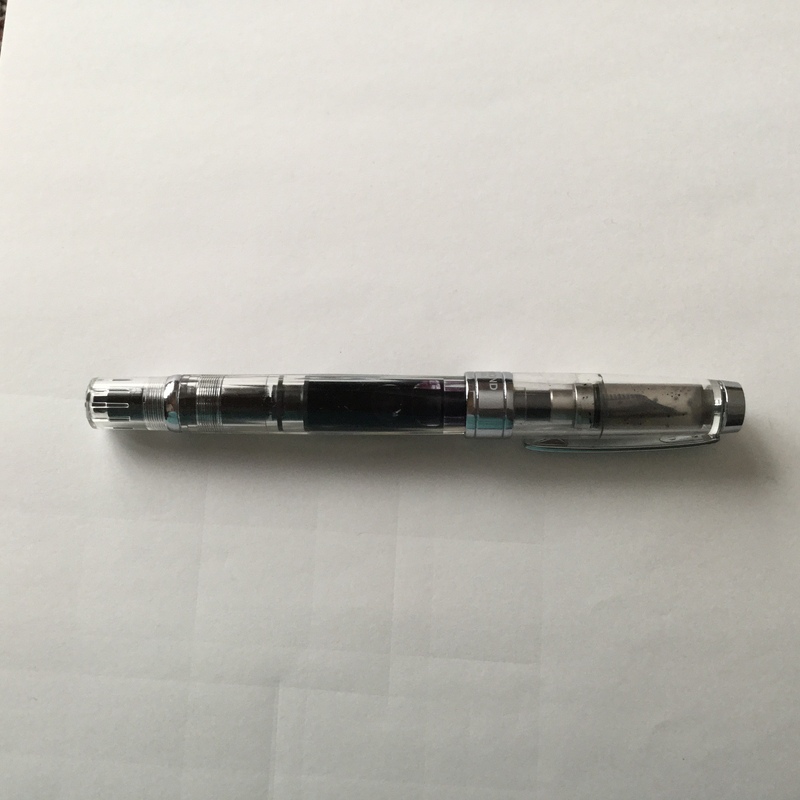 As someone who always posts her pens, it seems odd not to, but with the TWSBI one can't - or shouldn't, as the cap only posts on the very end, so there's a risk of turning the filling mechanism when removing the cap. I haven't had the pen for long, so can't really comment on how robust it is. I have slight concerns about the possibility that it might leak - I'm not used to a pen where the body is the ink chamber. This worries me a little, but I am not usually rough with my pens and the way it writes and the amount of ink it holds mean it has become my daily use pen very quickly. At the moment it is contentedly tucked into my Midori TN. And it was all over. England beat Wales in Cardiff. Wales were good in the first half, but different teams came out for the second half. I was disappointed, of course, but, more than that, I felt as though there was no point watching rest of the Six Nations, as we could no longer get the grand slam (or the triple crown). Yet we can still win the championship - this was the first match of the tournament. So, I shall continue to watch, but losing to the old rivals, in the opening game, that stung and took away a chunk of anticipation. Here's hoping it's a long time until Wales and England next meet in the first match. This week I received yet another impulse purchase: a couple of calligraphy books and a new set of pens. I have a set of Schaeffer pens, but they are very old, not well cared for and only take cartridges, so I decided to replace them with a set of Manuscript ones. So far, so good. I am now spending spare moments making shapes on paper that I haven't done for years. Hopefully I will be able to pick it up again fairly quickly. Nothing fancy, just a spot of italic and Old English style. I don't have a nib flexible enough for Copperplate; the softest I have is my shorthand pen, which isn't really good enough. Considering I make greetings cards, it is odd that I let my calligraphy slide. I think I dropped it at University. I had problems with tendons in my hands and my priority was definitely continuing to play the piano - and basic writing. This was in the days when essays were hand-written. Fortunately I was able to reduce the strain on my hands by switching from right- to left-hand writing and vice versa. I had problems with my ring and little finger on my right hand, which meant I couldn't grip anything, or, really, use either of the fingers for quite a while. I also had a bifurcated tendon in my left hand: the one that works the thumb. That eventually got surgery, after cortisone injections failed to work. Apparently it's not that common a condition and the surgery worked well. I still have problems with my hands and have to be careful to vary my movements to avoid any RSI. Well, that's my excuse for having some beading, some knitting, some crochet, some sewing and some embroidery all on the go at the same time: I have to switch regularly. Oh and varying the musical instruments I play, too. Last night it was a spot of mandolin practice, which only served to remind me how soft the pads on the fingers of my left hand had become. Ouch. Wow, the paper has come out very grey in this shot - the bottom half of the same photo as the Misty Blue Ink! Even so, I think the ink colour shows reasonably well. I really like this colour. I'm a big fan of purple, but also very fussy about the shade. So many purples are too blue, or far too pink. This has a nice balance - deserving the "Imperial" name, in my opinion. I have loaded this into my Parker Rialto, which is a medium nib and a very nice pen to write with. I can see myself using this colour for writing short notes, or greetings cards, quite happily. It may well get pressed into use to add small areas of colour to some Zentangle work that I do. In short; a generally useful ink to have. Yes, very pleased with this one. One of my new inks. I ordered this one as Marine was out of stock. I had decided that was my preferred ink. However, Misty Blue was my second choice. 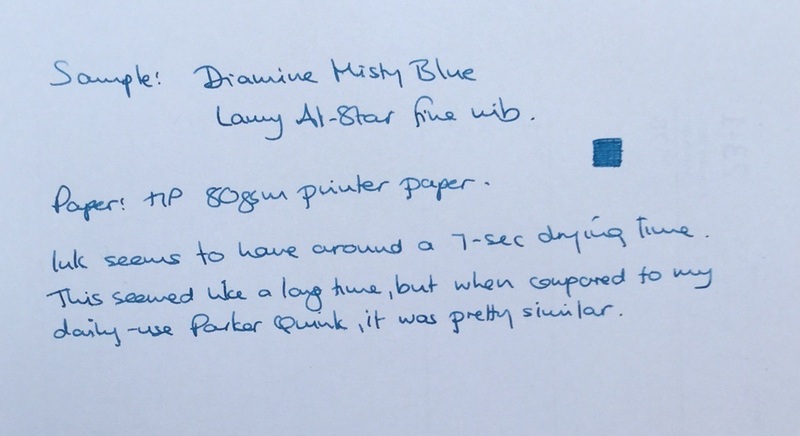 Ever since being forced to use Royal Blue Washable ink at primary school, I have rebelled against all blue inks. For day-to-day writing I still use Parker Black Quink. It has served me well over the years and I don't intend to change. However, I decided that I had far too many pens with black ink in and I could probably make good use of some different colours, particularly when making greetings cards. When I put my order in for a new fountain pen (a TWSBI Diamond 580), I added three bottles of ink, of which this is one. This is a photograph of a sample, admittedly not taken in the best quality light, as it is a drizzly winter day. I think the colour looks reasonably accurate though, just slightly darker than "real life". I like this ink and I can see myself using it, possibly even as a general writing colour. It is a reasonable compromise between too-blue and too-turquoise. The depth of colour is nice and it manages to make my shocking handwriting look half-way decent. Sometimes with a fine nib, black ink can look a little thin, whereas this doesn't. In summary, pleased with the purchase. I make extensive use of apps on my tablets for all sorts of purposes. I use ToDoist, Evernote, OneNote, Notability and iThoughts for many tasks. However, I also like to put pen to paper. I don’t always have an electronic device on me - sometimes it’s just not practical. Ok, I usually have my phone, but that's only any good for offline notes, thanks to it’s general state of uselessness and the poor mobile signal in the countryside. 3G is a luxury round here. In September I bought a couple of Leuchtturm 1917 Whitelines books. They are very nice, although in low light I find it difficult to see the lines. I have an A5 book that I use for jotting down blog/writing ideas. I also started using it from the back to jot down notes of things I wished I could tell my Mum and times I thought about her. Maybe that use will fade over time, as the memory of her death becomes less painful. I’m told it will. The small notebook is in my handbag, for jotting down “stuff”, which will generally get transferred to one of my electronic devices later in the day. I like the ability to photgraph the page and have it upload automatically into Evernote. That's very handy. The problem with the hardback books is that I agonise over what to write, and where. Also, to my surprise, they don’t seem to like fountain pen ink. Writing with any of my pens comes out pale and washy. Not ideal. Putting all this together and I wondered if perhaps I should go back to a Filoxfax. Ring-bound pages which can be moved around as I choose. I used Filofaxes of various sizes for many years, but I couldn’t find my old one. I also don’t think it was A5 size, which is the size I have decided I want. While I was browsing various journal-related sites I came across the Midori Traveler’s Notebook. Simple, cheaper than a Filofax and a reasonable compromise. OK, paper comes in small books, rather than single sheets, but notebooks can be removed once finished with. Plus, they aren’t/don’t have to be hole-punched. Filofax paper is also too thin for my taste. It didn’t take me long to make my decision and I have ordered a Midori Traveler’s Notebook. I ordered a couple of bits to go with it, but they didn’t have the connecting bands available. All being well I might manage to get hold of some large rubber bands which will do the job just as well. If not, I'll think of something. The notebook comes with a plain refill and not many refils seem to be available in the UK, so I started to investigate the possibility of making my own. I found a website devoted to this subject - mylifeallinoneplace.com - which contains some excellent downloads and advice. I have to say I have struggled massively with printing out a diary in “booklet” format. Allegedly my printer supports it, but let’s just say it didn’t go well and in the end I gave up. Having said that, I already have a diary, so I might slip that into a walllet pocket anyway. I have successfully made my own notebooks; one containing a mixture of blank and lined pages and another which is a bullet journal. I covered them with card which I had embossed. Just a little bit of embellishment, seeing as I don’t even have the TN yet. Once I do, I hope my usage will evolve over time and I will settle on the inserts that suit me best. I have been accompanying the local choral society since September (the first rehearsal was tough, coming, as it did, a few days before my Mum's funeral). At Easter I accompanied the local church choir in Fauré's Requiem - both groups share the same musical director. A lot of work for me and a relatively small audience on Palm Sunday. However, the choir sang well, enjoyed themselves, and several members of the audience took the time to come over to thank me for playing. Not to thank me for stopping, but rather they seemed genuinely impressed with my efforts. I'm not used to this. I judge my abilities against how good I was when studying music full-time (with less creaky fingers, tenosynovitis aside) and I come up short. Back then, I compared myself with the best of my class and I was way down the order. That's no surprise, as any music department has people of varying abilities: second-instrument pianists, Grade VIII pianists, through to potential concert pianists. I was somewhere between the last two on that list. Never good enough, that's my assessment of my abilities. As a pianist, I wasn't involved with music-making after I left university, though I continued to play. I eventually moved to London, where there is music everywhere. I attended concerts, but only ever played for myself. I never got involved. I did do some theatre work and occasionally that included recording some piano tracks - on an Atari ST over MIDI, but that was it (I still love working with MIDI). Two years ago I moved to a small town/large village in Dorset. Within a few months I was accompanying a local WI choir, which lasted about eighteen months. More recently I have become involved with the aforementioned choral society. My first concert with them was last weekend: our Christmas concert. It went well. The choir sang the best they have all season and I actually enjoyed it. See, whilst I love playing, and I particularly love accompanying, I don't like performing. In this performance I was moving between the piano and organ a lot, so had to walk up an aisle of the hall as well, through the audience. I don't like being on display much, so I found that hard to do. Since I moved here I have done concerts in local care homes and a performance at a charity gala with a friend who sang. OK, it was "lounge bar" music just while guests arrived, but we were there, in evening gowns, doing our bit. I loved it! I have now done a performance for another Mayoral function, a concert and also played organ for a church service, something I last did at the age of 18. I think I might actually be getting over my stage-fright; something which hit me at the age of 11 and has had a huge effect on my life ever since. I can't do presentations at work: I can deliver training, but if I have to do a presentation I am physically sick. I can barely even stand on a stage. This has been a huge struggle for me. I watch other people stand up, completely at ease with an audience and I don't know how they do it. I watched my brother deliver a eulogy at my Mum's funeral, reading anecdotes she had written, in the most testing of circumstances. He was amazing. All I could offer was a recording of me, playing a piece of music we both loved to play. I am playing for a 9 lessons and carols service next weekend and I'm quite looking forward to it. So much so, that I am considering offering to play for Midnight Mass. Usually they have to do without the organ, as nobody wants to play at that time. But I will only be at home, possibly asleep. I'm not going away for Christmas and I'm not really looking forward to it at all this year, after recent events. So should I do something that I will enjoy, is no real hardship for me, and will probably give a group of people a fair amount of pleasure on one of the most important days in their year? Yes, I think I probably should. Perhaps I am finally understanding the power of music, not just for myself as a method of de-stressing, but as a way I can make other people happy. It pleases me greatly that this seems to be the case. I actually feel like I have something to offer society, something I can give back and that's a great feeling, particularly at this festive time of year.